Call me crazy, but birthdays are stressful. At least for me they are. 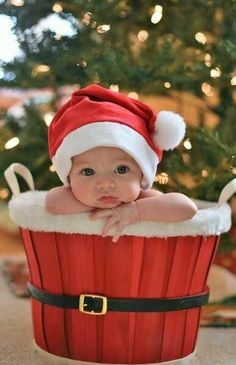 It could partially be because my special day happens to coincide with another special day for millions of people around the world (you’re reading the words of a Christmas baby y’all) but, the stress exists nonetheless. I’ve never been one for big birthday parties (again, the holiday does complicate things) and I dread the moment each year when groups of people crowd around me to sing a horribly out-of-tune version of ‘Happy Birthday’ while making unflinchingly direct eye-contact. Cue the sweaty palms. Then, there’s the cake. Birthday girl or not, I’ve never been one to voluntarily cut cake. Everyone’s got their requests – corner piece, middle piece, lots of icing, bigger piece, smaller piece (“are you trying to make me fat? !”), you get the gist. Too much pressure, so I step back and let the cake pros work their magic. 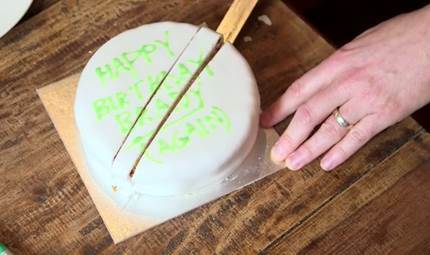 Turns out, there really are no cake-cutting pros. Why? 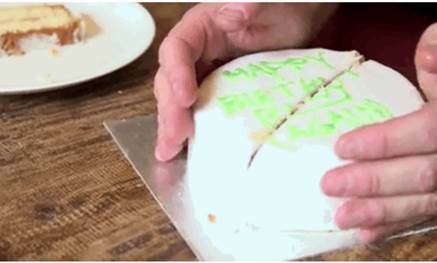 Because WE’VE ALL BEEN CUTTING CAKE WRONG OUR ENTIRE LIVES. I’ll pause for a moment to let the gravity of the situation truly sink in. 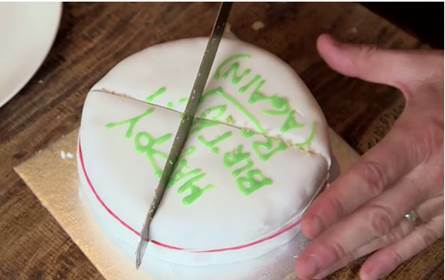 British writer and broadcaster Alex Bellos recently released a new, smarter way to cut a round cake. His method serves up perfect, uniform slices each time while maintaining the freshness of the cake to make it taste great even longer. Mind = blown. First, the oh-so-dated method of round cake cutting. Look at that gaping hole in the middle of the cake that will begin to go stale if not eaten immediately. How sad. And now, the right way. Cut slices out of the middle of the cake. That way, you can push the remaining sections back together when you’re finished to preserve the rest of the cake. You can watch the full video tutorial here and, for some odd reason, it’s pretty fascinating). If you’re feeling really Martha Stewart-y, you can even use a rubber band to really hold everything together before your next slice. But, we must give credit where credit is due. 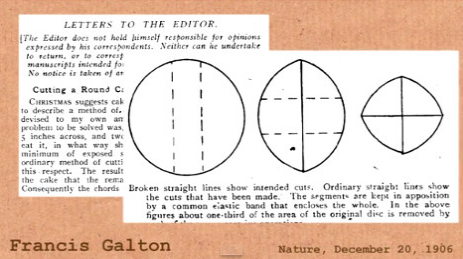 While Mr. Bellos may be the biggest Internet cake sensation right now, the key to this cake-tastic discovery was actually unlocked in 1906 by mathematical scientist Sir Francis Galton. See, who says math can’t be fun? So remember kids, math is what happens when you eat your cake and play with it, too!